Thank you all so much for the well-wishes and prayers. The period of time before and after the wedding was quite hectic! I had to cancel my attendance at our annual Religious Archivists conference due to illness. And so, I am just easing into responding to the multitude of emails that I received upon my return to work. I haven’t received the professional photographs, but here are a few of the ones my friends posted online! Sorry we’ve been lax about the blog recently. We were on some time off, I was on holidays in Donegal and Kathleen in Clare – each in our ancestral homes! We received a phone-call a few weeks ago from Anne, a relation of 4 Boyle sisters, members of the Institute, now deceased, who had come across a photograph of the family with two of the professed sisters. Anne came to see us in the Archives, and left a copy of the photograph with us. As, is too often the case, the records were sparse on personal details. Then we hit luck, twice! Sr Camilla had known some members of the Boyle family and was anxious to meet Anne. Sr Colette from the English province who was in Ireland on holidays, had known one of the Boyle sisters who had been her provincial in England, and this morning she came in to meet Anne over tea and coffee in the Archives. A short trip across the Green led Anne to Sr Camilla, and a further mine of information! 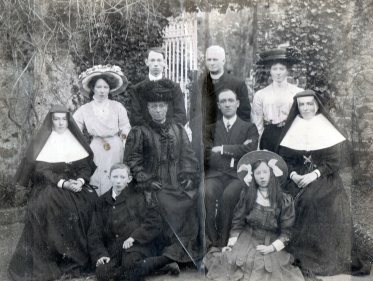 I was fascinated by the photograph, a portrait of a family all dressed in their finery, an insight into a middle class Catholic family in the beginning of the 20th century. The photograph was taken in the grounds of Loreto Abbey Rathfarnham, some time after the profession of two of the four Boyle sisters. The individuals were identified and something of their paths in life were recorded on the reverse. (A copy of this was also taken for the Archives.) Seated centre, in her widows weeds is the matriarch and on her right hand side, the eldest son, a publican and de facto head of the family. (I love the authoritarian pose with crossed arms!) Of the other two sons, one became a dentist and the other a medical doctor. (I can’t make my mind up which entered which profession…..). Two of the three girls in secular dress were to enter the Institute.